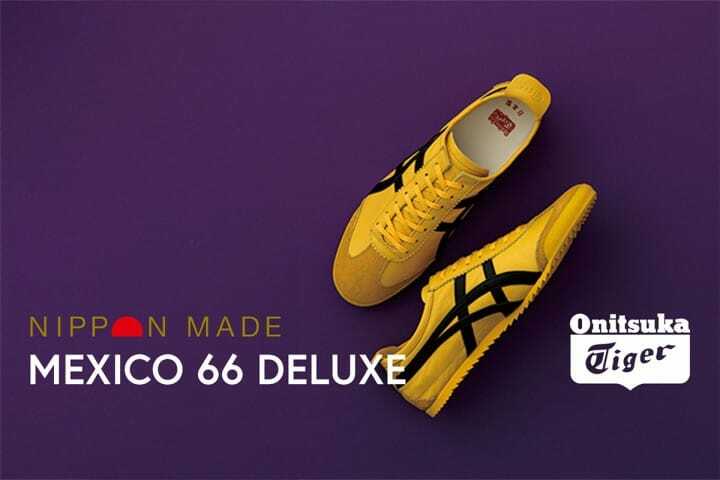 https://matcha-jp.com/en/6543 Brand-New Onitsuka Tiger MEXICO 66 DELUXE NIPPON MADE Shoes At A Discount! Brand-New Onitsuka Tiger MEXICO 66 DELUXE NIPPON MADE Shoes At A Discount! Onitsuka Tiger, a famous Japanese brand known for great shoes, released a new product from their NIPPON MADE line! We introduce the stylishly designed and finely made MEXICO 66 DELUXE shoes with pictures. We also tell you how to obtain them at a discount. You can find an endless amount of artisanal goods in Japan, from jet black lacquerware, to writing utensils detailed with gold lacquer, to finely crafted Japanese knives. If you are looking for a special gift that allows you to sense this craftsmanship for yourself, Onitsuka Tiger’s NIPPON MADE shoes are for you! In this article, we introduce NIPPON MADE’s new product lineup, which utilizes Japanese techniques, and how to buy Onitsuka Tiger products in Japan at a reasonable price. Continue reading to find out how you can obtain these high-quality, Japan-only shoes at a bargain! NIPPON MADE is a shoe collection created by Onitsuka Tiger, a Japanese sports fashion company. The artisans of these goods put time and care into selecting the materials, dyeing, sewing, and adding the final touches. All of this occurs in Japanese factories. The resulting product is beautifully crafted and designed Japan-made shoes. NIPPON MADE shoes are made by craftspeople, one shoe at a time. They are elegant in appearance and also high in quality. Due to this, these shoes have attracted a lot of attention and have shoe and sneakers fans from all over the world! MEXICO 66 DELUXE, New to the NIPPON MADE Line! MEXICO 66 DELUXE is the latest product to the NIPPON MADE lineup, and is part of the fall 2018 collection. These exciting new shoes have an especially colorful finish and utilize high-quality leather. MEXICO 66 DELUXE / 21,000 yen (plus tax) *Can be purchased at a reduced price in Japan! The season’s newly released shoes feature soft, velvety goat leather. The leather undergoes a washing process, allowing you to enjoy a comfortable, broken-in feeling. In addition to standard colors, four new colors have been added this season: WHITE/BLACK, CREAM/GREEN, BURGUNDY/WHITE, and TAICHI YELLOW/BLACK. Create an effortlessly stylish appearance by matching the WHITE/BLACK or CREAM/GREEN shoes with some well-fitted clothes. You can add an accent to a minimalist outfit by putting on the BURGUNDY/WHITE or TAICHI YELLOW/BLACK shoes. These shoes are very easy to style and pair well with many different looks. Be sure to pick your favorite color soon as they are all popular! Japanese Tradition Found in Shoes! MEXICO 66 DELUXE *Coming Soon! / 28,000 yen (plus tax) *Can be purchased at a reduced price in Japan! For those wanting shoes which allow you to get in touch with Japanese tradition, be sure to look for the MEXICO 66 DELUXE series’ BLUE BELL/INDIGO BLUE and ROSE WATER/BURGUNDY shoes from the NIPPON MADE line. These shoes are dyed by pasting Japanese washi paper onto the shoe fabric, sheet by sheet, with traditional Japanese techniques. They have a unique texture, unlike any other shoe. Wearers can enjoy the soft appearance of washi paper on their feet! MEXICO 66 DELUXE / 27,000 yen (plus tax) *Can be purchased at a reduced price in Japan! Beautiful, whimsical patterns are featured on the BLACK/GLACIER GREY and BRIGHT ROSE/ROSE WATER shoes from the MEXICO 66 DELUXE series. The leather is dyed with a traditional technique called “suminagashi,” or paper marbling, which involves transferring a design floating on the surface of the water to the leather. The resulting designs from the paper marbling vary slightly with each pair. Be sure to compare them yourself in the store! The shoes are all in elegant colors, making them easy to match with any outfit. You can brighten up your look by pairing them with lightweight clothing, like denim or leggings. Did you know Onitsuka Tiger stores in Japan offer a discount service for international tourists? At stores in Japan, you can receive a tax exemption when making a purchase over 5,000 yen. You can receive an extra 5% discount on top of your total by showing your passport at the register! The NIPPON MADE collection introduced in this article are applicable for this discount as well. This is your chance to obtain high-quality NIPPON MADE shoes at a great value. Be sure to take advantage of this discount! * If you would like to read other articles on Onitsuka Tiger and their stores, we recommend viewing our page for the brand here! * This article introduces tax exemption and discount services for visitors to Japan. These discount services are not available for Japanese nationals and non-Japanese residents of Japan. We appreciate your understanding and cooperation. Photos courtesy of ASICS Corporation. Onitsuka Tiger Sneakers At A Discount - The New Fall Version! Onitsuka Tiger Shinjuku East Store - Try The NIPPON MADE Custom Order! Onitsuka Tiger's New MEXICO 66 PARATY - At Discount Prices Only In Japan!